When I found these cleaned ready to cook Mussels, the first thing I wanted to do was to eat them with some chilli. 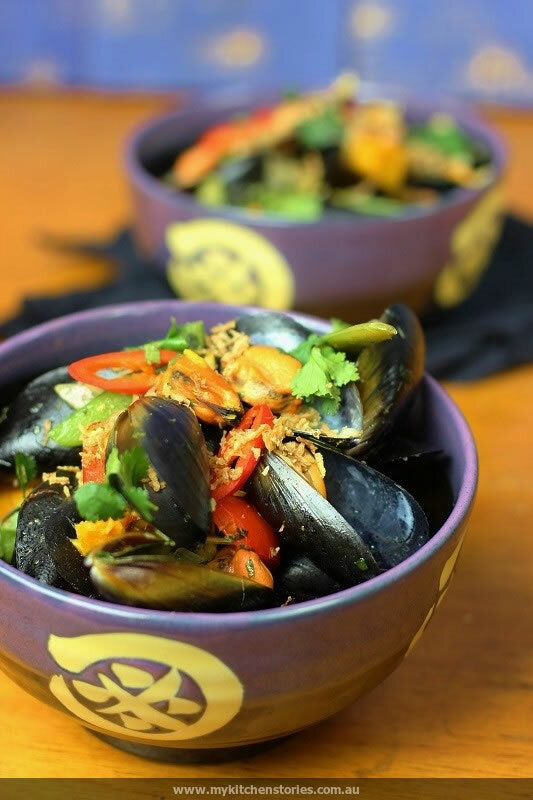 After I had cooked them with a Thai Green curry broth I flipped over the pack to find a Green Curried Mussel Recipe on the back. I had to laugh. Australia how you love Thai Food!. I particularly like mussels with chilli. At one time I spent 3 months living in Thailand on Cheweng beach, doing a bit of work in the kitchen and talking people at the ferry into coming to stay at “our” place. 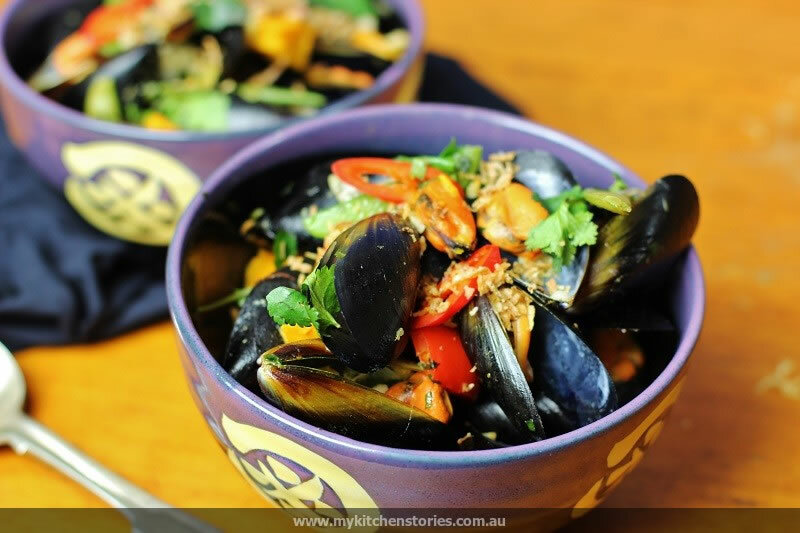 Each time there was a full moon I would go to the market buy mussels, chilli, lime, ginger, garlic & sometimes a local curry paste, I’d cook up a wok full of mussels and share them with who ever was staying at the time. After mussels we headed off to dance and drink Mekong Whisky. What a life! When I left Chaweng beach I tied the wok to the back of my back pack and each time I picked up my pack or put it down the wok swung out and hit whoever was in it’s radius. Choose a medium sized deep heavy pot. Heat the pot gently and add the oil, onion, garlic, ginger and green curry paste and sweat on low till translucent. Add the drained mussels and add a lid. Bring back up to the boil then take off the heat. Shake the pot occasionally till the mussels are opened. Just love your photography! How wonderful .. the recipe sounds divine too. Yum! 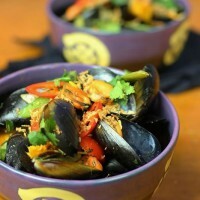 I have never seen or tried green curry mussels! What a great idea though – they are so often served with tomato /chilli but this would be a lovely alternative. 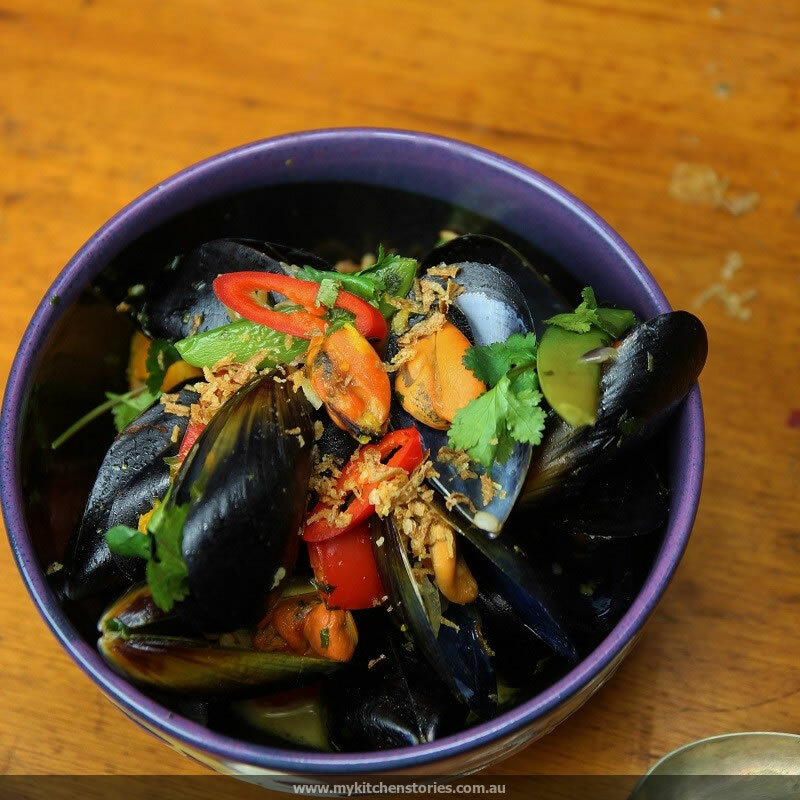 There’s something so satisfying about a big bowl of mussel isn’t there? Funny about the wok hitting everyone – at least you had a self defence strategy if ever required. Lovely photos and it’s great to learn more about your past through each post. 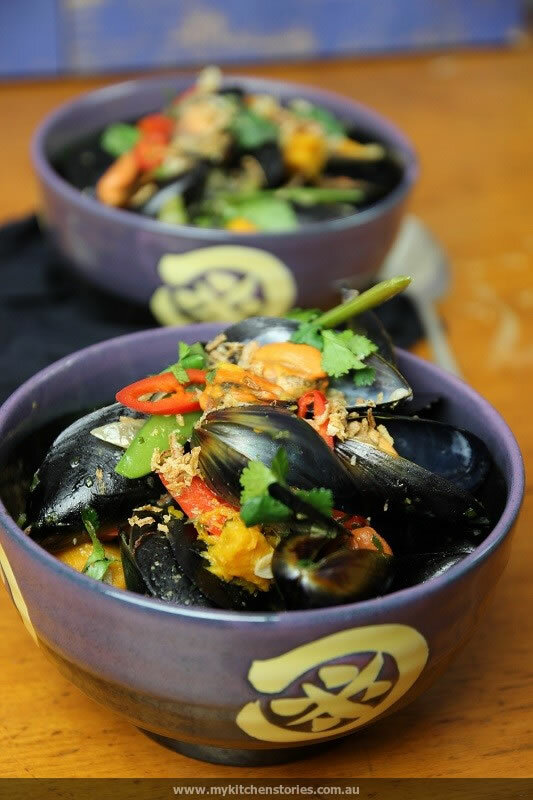 Mussels in green curry…that’s new for me. I love your serving recommendation with quinoa or barley.